French team FDJ have a scooter they train behind. It’s named ‘Vasil’ after Sky rider Vasil Kiryienka because of the relentlessly punishing pace it delivers. It seems that riding along behind it is almost – but not quite – as uncomfortable as trying to stay in a peloton that’s being driven along by the man himself. It’s not that Kiryienka’s quick, as such. For all that a Grand Tour lasts three weeks, the crucial moments in a bike race – the moments that make up the time gaps in the general classification – typically hinge on hard efforts that last from just a couple of minutes up to about an hour. Kiryienka doesn’t really do that. His thing is hammering along for hour after hour after hour. 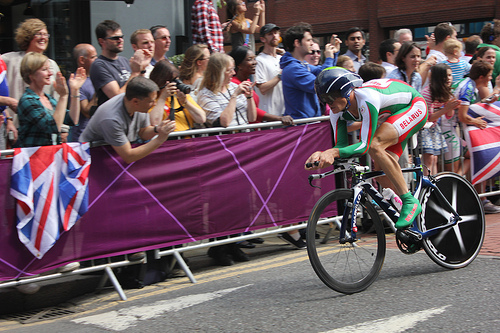 A 60km time trial therefore suited him well – although a 200km time trial would probably have suited him even better. The big losers on the day were pretty much everyone else. None of the other overall contenders finished in the top ten. That’s unusual, although a wind change halfway through the day also played a part. Rigoberto Uran was the only one to finish within three minutes of Kiryienka. Fabio Aru was 3m01s back while Richie Porte lost another 1m19s on top of that, finishing 55th. The Tasmanian’s hurt, tired, pissed off, unmotivated and out of the reckoning. After one day in pink, Aru again trails Contador, but now by the far-more-meaningful margin of 2m28s. Andrey Amador is in third 3m36s back and Rigoberto Uran is fourth at 4m14s. Then, to underline that something has gone very wrong for at least 10 top riders, we have none other than Jurgen Van Den Broeck in fifth at 4m17s. How did he get there? No-one knows. Mountains and a good, solid summit finish. Tough stuff after turning yourself inside-out in a time trial the day before.